NASA says astronauts will haul two pieces of a small space station to lunar orbit in 2024, during the second crewed flight of the Orion spacecraft. Plans for the station, which is now referred to as the Gateway, have been shaping up since 2017. The Gateway, Space Launch System rocket and Orion crew capsule represent the core of NASA's plans to send humans back to the Moon and on to Mars. The Gateway is designed to host astronauts for short-term stays, serve as a waypoint for crewed surface missions and receive samples robotically collected from both the Moon and Mars. The first piece of the Gateway is a power and propulsion module, scheduled to launch on a commercial rocket in 2022. The first crewed Orion mission, a lap around the Moon that will not stop in orbit, is scheduled a year later, in 2023. 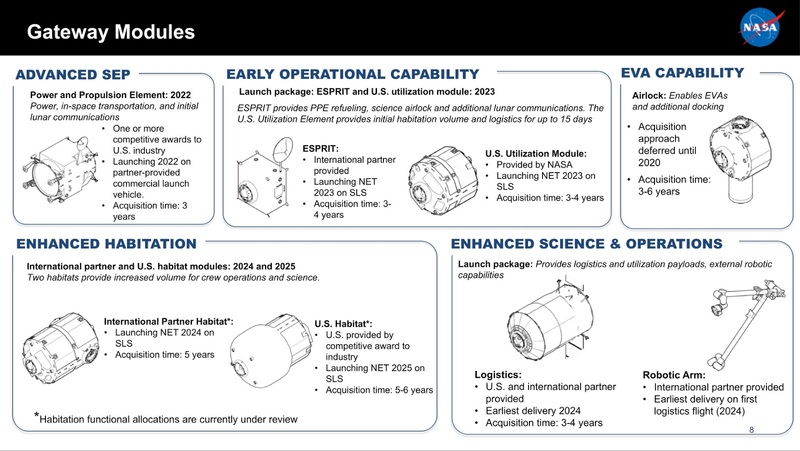 Then, in 2024, another Orion crew will fly to lunar orbit and visit the power and propulsion module, with two more pieces of the Gateway in tow. 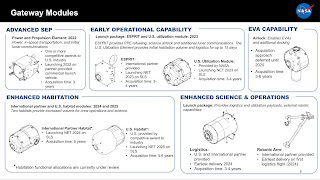 "NASA plans to deliver two modules on the third integrated flight of the Space Launch System (SLS) rocket and Orion spacecraft, targeted for 2024," said Kathyrn Hambleton, a NASA public affairs officer, in an email. 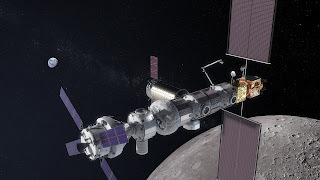 NASA dropped the RFP for the gateway station 's power and propulsion module already, too. NASA updated the assembly schedule for the Gateway: note! Nowhere does it say anything about Russian participation. The acquisition strategy decision for the airlock Russia was claiming it would build has been delayed until 2020. I have expect it to be delayed another year, tbh. Japan wants to participate in the Gateway. NASA conducted the final parachute test for the Orion capsule.